Recent calls for university administrators to advance interdisciplinary research and teaching have suggested that allocating campus space to such initiatives is key to their success. Yet questions remain concerning just what kinds of spaces are most conducive to this agenda. This article aims to shed light on this relationship by drawing on case studies of five interdisciplinary area studies centers for the study of the Middle East from US campuses. From interview and observational data, we examine how faculty and staff perceive and use their space to support interdisciplinarity, and the ways that spatial attributes condition centers’ operation. Our cases highlight how interdisciplinary space is a complex configuration of material form, location, and meaningfulness, as these spaces are relationally embedded in broader campus geographies, and human agents construct meanings for them that are not determined by their physical design. We conclude with lessons for practice and further research concerning the different ways that campus spaces can be designated to facilitate idea trading across disciplinary boundaries, build cross-disciplinary community, and achieve legitimacy for interdisciplinary enterprises. 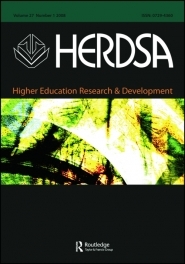 "Creating interdisciplinary space on campus: lessons from US area studies centers," in Journal of the Higher Education Research and Development Society of Australasia, ed. (Taylor & Francis, January 8, 2016), http://www.tandfonline.com/eprint/eDSQ47sAYpP8ECiFBKyx/full.